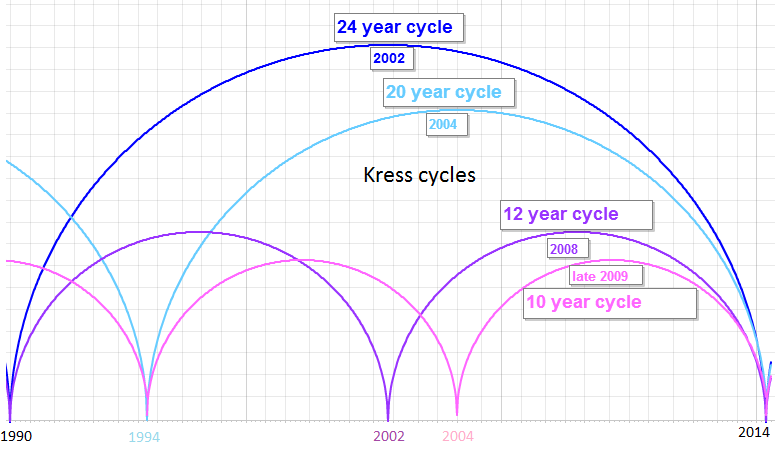 We discussed and gave you a visual of the long term Kress cycles (120yr, 60yr, 40yr and 30yr) and you saw that in theory they all should bottom together in the second half of 2014. This alone should make one wary of the market as I question just how precise these predictions are when it comes to an exact date. Heck, if your are within 2-3 months on these long cycles I think you would call it a direct hit!!! But, that is just part of the story as there are 12 cycles in the Kress cycle series. The cycles shorter than the long cycles are still longer than most of us trade (definitely too long for swing trading). They are the 24yr, 20yr, 12yr and 10 year cycles. There are 5X24 Year cycles, 6x20 year cycles, 10x12 year cycles and 12x10 year cycles in the 120 year cycle. And guess what - they are all scheduled to bottom in the second half of 2014. If you pursue this you will see the Fib relationship can be extended to the longer cycles. Using his cycle system, Mr. Kress correctly identified the 1999/2000 stock market top and also the 2002/2003 end to the bear market. More recently, Kress identified the stock market top in 2007 and is looking for the start of a new cyclical bull market to begin soon. We saw the Kress 12-year cycle bottom hard in 2002, producing a major bear market low.Â We saw the 10-year cycle bottom in 2004, producing a mini-cyclical bear market and another leg of the bull market following its bottom.Â We saw the 6-year cycle descend into 2008, adding downside impetus to the credit crisis and producing another cyclical bull market in 2009. If you desire further information I invite you to research and expand on this info and share it with us. Just how powerful is the 40-year cycle? Well consider that in the previous 120 years the 40-year cycle bottom has never failed to produce a major market decline. From the decline in late 1894 to the corrective pullback of 1934 to the devastating decline of 1974, the 40-year cycle has always made its presence felt in the stock market. Great work, Inlet -- appreciate your posts. As always great insight! TYVM! Good to see you here TB. Every now an then I have a clue, but I try to listen to others and learn.